The goal of the program is to develop the ability of participants to formulate theologically based actions directed toward "the great ends of the Church," as these ends have been understood in the Reformed tradition. 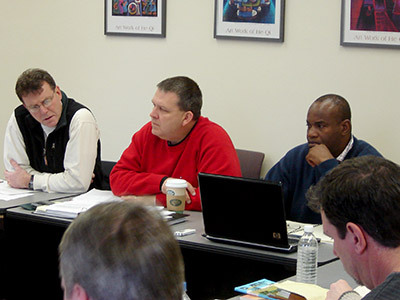 To accomplish this purpose, core seminars in the Reformed Focus of the DMin program develop the student's awareness and understanding of Reformed contributions in the areas of biblical studies, theology, ethics, and worship. In addition to these seminars, the Proposal Colloquium and electives are required for the Doctor of Ministry degree. Classes for this DMin cohort meet for two weeks in January and June for two years in Pittsburgh and Scotland. This program is 36 credits and is to be completed in three years. Applications to the Reformed Focus of the Doctor of Ministry program are accepted on a continual basis. Apply now to reserve your space in the next group.